It is a warm 30 º C here but inevitably autumn has started to touch the land and the leaves are beginning to rustle and turn golden. I am never sad to see the seasons change, as with it comes different produce to grow or buy, cook and eat. That is not to say I have dismissed all summer produce, for instance now is my favorite time to eat UK tomatoes as they have had the chance to develop a fuller flavor with the warmth of the September sun. It is also a great time to look out for bargain summer ends like cheap boxes of peaches, apricots and strawberries or better still hedgerows of free wild blackberries and raspberries all of which make great jam or can be frozen for later use. 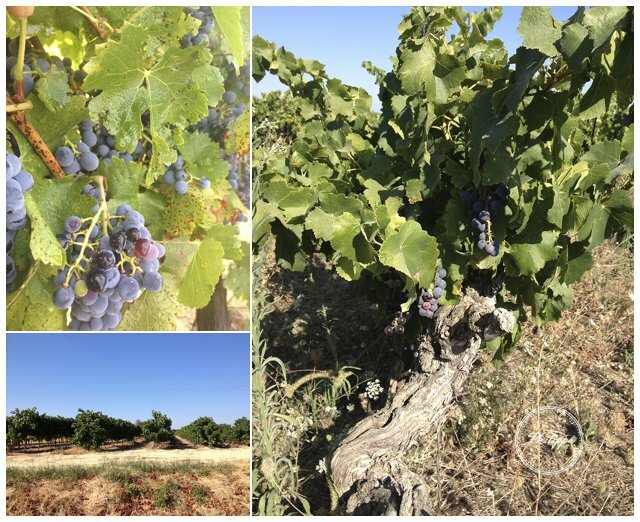 photo – Left – Wild blackberry picking. 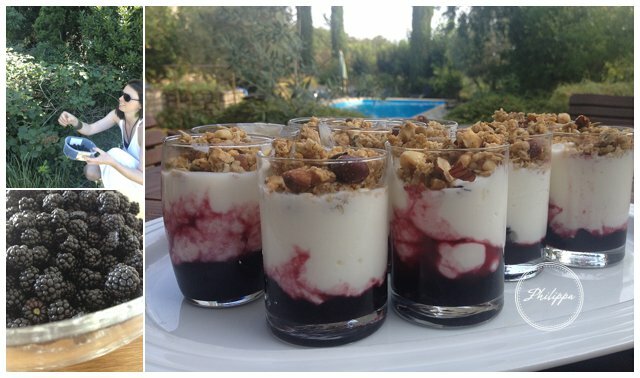 Right – Home made yogurt with hazelnut and almond granola and blackberry compote. 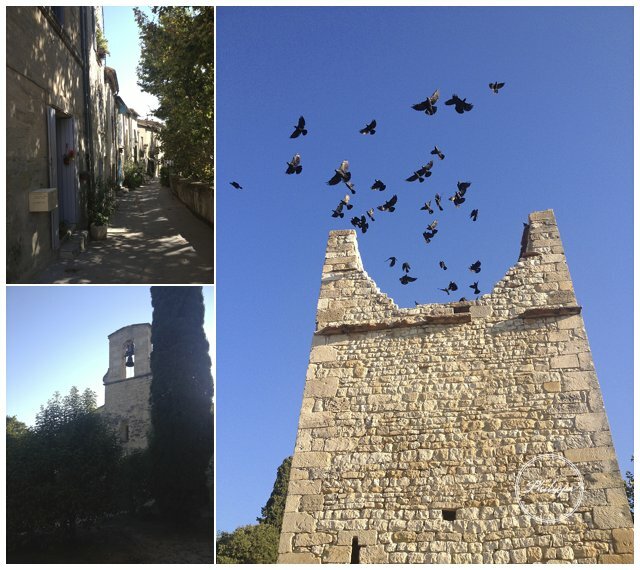 Always keen to shop at local markets I jumped at the chance to try the small, non touristy offerings of the neighboring villages; Sainte Chaptes on a Thursday and Saint Quentin la Poterie on a Friday. At Sainte Chaptes, small but funtional, there was a veg man, a butcher and bizarrely someone selling bed mattresses with dried beans – perhaps some princess and the pea marketing technique that is yet to grip the rest of Europe? There was admittedly not much choice but I decided this was a good thing, everything was produced locally therefore fresh and seasonal and I couldn’t spend ages dithering at what to cook for that nights’ dinner party. 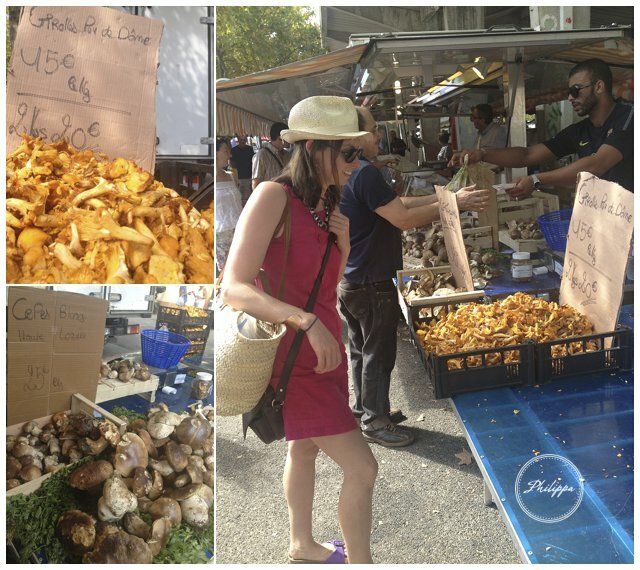 My mind was made up when I spied a healthy looking box of Autumnal chanterelles and some huge porcini. A lot of recipes will put mushrooms with garlic, which of course is delicious but beware not to overpower them. Use the cloves sparingly and pay great attention to how fierce you fry them as there is almost nothing worse than the obnoxious taste of even slightly over cooked garlic. The earthy woodland floor taste of mushrooms marries particularly well with the sweetness of prawns and a splash of fino sherry or dry white wine and of course cheeses like Parmesan or Gruyere are other great partners. This postcard recipe gives you an idea with what to do with some of the first wonderful Autumn ingredients, wild mushrooms. When served together these two recipes serve 6 as a starter. I put both the finished dishes in the middle of the table for people to help themselves. Mix the creme friache, mustard and cheese together, season with black pepper. Slice the baguette into thinish slices – two each should be perfect. 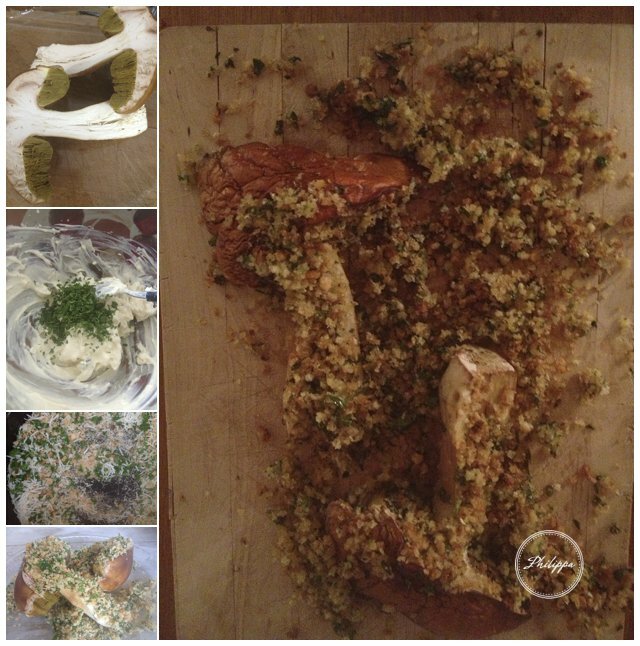 Smear the cheese mix on each of the breads and lay out on a baking tray. 4)Bake in a 180 º C oven for 10 mins. Check they are clean – brush off any dirt, and pick out any stray leaves and bits of forest floor. Any particularly big ones can be ripped in half. In a wide frying pan ( you don’t want the mushrooms being over crowded and sweating) add 1 tbs olive oil, 1 tsp butter and the garlic and gently fry, just as the garlic starts to turn golden add the lardons. 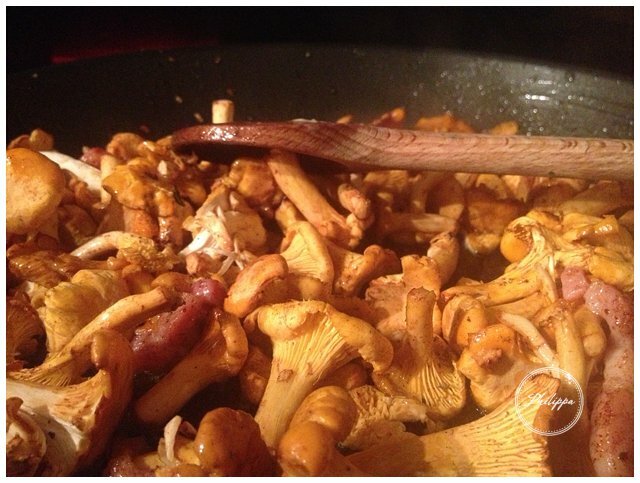 Fry for a couple of minutes then add the chanterelles, season with salt and pepper and add the parsley. To serve place the hot cheese toasts on a serving platter and sprinkle over the mushrooms mix. I finished the dish with some crisped up Parma ham. Sprinkle this over the mushroom and bake for 10 min at 180ºC ( if cooking the two dishes together just put it in at the same time as the cheese toasts. You can serve it in the baking dish or laid out on a wooden board for that charming woodland touch.